Japan is hoping for a breakthrough on a long-standing territorial dispute. That’s not likely to happen. On December 15, 2016, Russian President Vladimir Putin is slated to visit Japan, where he will meet with Prime Minister Shinzo Abe to discuss the future of Russo-Japanese relations, including the possible resolution of the territorial dispute around the South Kuril islands (referred to in Japan as the Northern Territories), as well as signing a peace treaty, both issues plaguing bilateral ties since the end of World War II. There are expectations in Japan that Putin’s trip, which had been under discussion for several years and would mark the president’s first visit to Japan since 2009, might bring about tangible progress in the dispute. However, that is highly unlikely to happen due to Russia’s demonstrably stronger hand in negotiations, no observable shift in Moscow’s official rhetoric on the dispute, and the question of precise border demarcation, which might well prove the stumbling block to any resolution. Overall, the Putin-Abe talks will probably end up being little more than a talkfest, whereby both sides strike some minor deals, but nothing of real consequence is achieved. Since Russia-Japan relations started gaining traction in the wake of Abe’s May 2016 visit to Sochi, there has been cautious optimism building up in Japan with regard to breaking the Northern Territories impasse, given the announcement that the two countries plan to deal with the issue based on a “new formula.” While it has not been officially confirmed, some have speculated that this new formula will be buttressed by enhanced economic cooperation. There is reason to suggest that Abe intends to use closer economic ties as the proverbial carrot with which he hopes to tempt Russia into relaxing its uncompromising stance on the disputed islands. On closer inspection, however, this approach seems overly optimistic. It would be reasonable to suggest that Japan has no hidden trump card in negotiations with Moscow; otherwise it would have been used long ago. Thus the Kremlin clearly enjoys the upper hand and is in no hurry to strike any specific deal regarding the South Kurils. Despite the various economic benefits that Japan has proposed to Russia in exchange for settling the dispute, Moscow gains precious little by handing even a single island over to Japan. Both Abe and Putin would be risking their high approval ratings by moving the negotiations forward, yet only the former seems willing to bet his popularity in return for making immediate headway on the issue. Meanwhile Russia appears to be moving more slowly, if at all, in this regard and is not inclined to reach a deal simply for the sake of relegating the long-standing impasse to the history books. Perhaps an even more salient issue pertains to what a hypothetical deal involving the demarcation of the disputed islands would look like. The most likely scenario would entail Japan receiving the smaller island of Shikotan and the Habomai islets in accordance with the 1956 Soviet-Japan Declaration, with Russia retaining sovereignty over the bigger Iturup and Kunashir. That can perhaps be indirectly confirmed by the fact that Russian militarization of the disputed territories (including the recent deployment of the Bastion and Bal anti-ship capabilities) has been limited to Iturup and Kunashir, meaning that the Kremlin actually might consider parting with the remaining islands. It is obvious, however, that merely agreeing to the transfer of two islands would go against Japan’s traditional stance on the issue, and Tokyo would need a bonus to go along with such an arrangement. Possible incentives for Japan, in addition to Shikotan and Habomai, include negotiating the transfer of a third island at a later date, or establishing joint sovereignty or economic exploitation over all four islands. Moreover, Japan claiming sovereignty over any number of the disputed islands creates a security issue of whether Japan’s newly acquired territories would be subject to the U.S.-Japan Security Treaty. While Tokyo has already assured Moscow that the Northern Territories are exempt from the geographical scope of the treaty, such unwritten promises were unlikely to have mitigated the Kremlin’s concerns, especially given that Russia’s whole rationale for its contentious foreign policy has been the narrative of being militarily encircled by the West. Therefore, as an anonymous source in Japanese academia told the author in early November, while Putin’s trip may signal the start of productive talk concerning the territorial row, its resolution remains a distant hope rather than a realistic expectation; the near future is unlikely to bring any real progress. Similarly, one of Russia’s leading experts on Japanese politics, Dmitry Streltsov, goes as far as to suggest that it is hard to imagine Russia handing any islands at all over to Japan, even based on a legally perfect solution, as the vast majority of Russians are still opposed to the notion. Streltsov argues, however, that the impasse might actually have a silver lining for Japan, especially the government, which can exploit the continuing row for political purposes and gain popular support by maintaining claims to the islands. While meeting with Japan’s Foreign Minister Fumio Kishida two weeks before Putin’s visit, Kishida’s Russian counterpart Sergey Lavrov told the press that there should be no high expectations for immediate headway on the peace treaty or disputed islands, but Moscow is committed to continuing work on the issue. This attitude has been expressed by Lavrov and Putin on more than one occasion in recent months, and Japan should probably be prepared to hear similar phrases from the Kremlin for the foreseeable future. 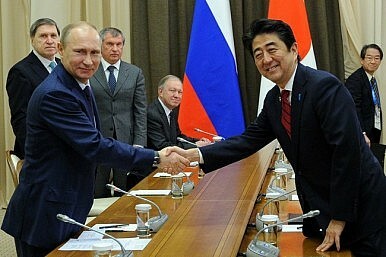 Abe's Russia Trip Comes to an Underwhelming EndPutin Surprises Abe With Offer of Japan-Russia Peace TreatyHow the Kuril Islands Are Testing Shinzo Abe's StatesmanshipShinzo Abe Going All In on Improving Japan-Russia TiesWill Japan and Russia Finally Settle Their Territorial Dispute?